An aerial view of Vault Hill, located almost in the heart of Picton. Picton is barely half an hour’s drive away from Campbelltown, but it offers a lifestyle that could be 1,000 kilometres away. 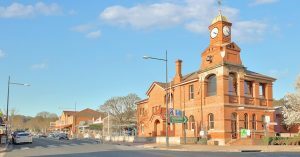 While the major urban centres of the Macarthur region, Campbelltown and Camden, are groaning from the pressures of massive population growth, Picton remains a laidback country town. There’s none of the congestion Camden and Campbelltown residents experience seven days a week, nor parking shortages or long queues when out shopping or banking. What Picton does have are all the facilities of a modern city, and most of them within walking distance. But most Macarthur locals would know all that, because Picton is a favourite Sunday drive destination for Campbelltown and Camden residents as well as further north in Liverpool. 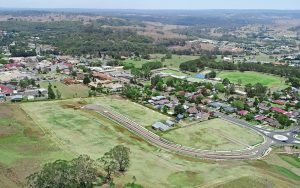 Those who come over Razorback Mountain on the Old Hume Highway would agree that once they’ve gone past Antill Park Golf Club the sight that greets them is of a beautiful country town that’s a world away from the place they left behind. Not far into the town, to the left of a new roundabout, visitors to Picton may have noticed a newly developed housing estate called Vault Hill. Farm owners Georgie Kennett and Jamie McLaughlin loved their new life at Picton so much they developed this fabulous estate right in the heart of township so they could share their blissful existence with others. Its elevated position means Vault Hill overlooks Picton, but there’s more to this prestige estate than just wonderful views of a pretty country town. Vault Hill is within walking distance of most of the modern facilities of Picton, including Picton Mall and medical centre, cafés and alfresco dining, bowling club, hotels and restaurants. Other Picton facilities include the heated indoor pool in Wollondilly Leisure Centre in Argyle Street, ambulance, police and fire stations. At Picton Railway Station you can catch a fast train to Sydney, Macarthur Square or the Southern Highlands. Picton residents also have access to both government and private primary and high schools. If you are thinking the time has come to seek a better lifestyle for you and your family, Vault Hill may be the answer. But you might have to get a move on because while 25 lots were developed at Vault Hill, most have been snapped up since going on the market. Zac Cronin from My Property Consultants, who is marketing Vault Hill, says there are just eight lots of land left. Among the eight you can choose a large lot of almost one acre (3,593 square metres) for $699,000 or a 752 square metre lot for $499,950. To find out more about all the lots still available – and if you’re really serious about escaping from the madding crowd – give Zac Cronin a call on 0419 474 307. Picton offers a relaxed lifestyle.